New York (October 10, 2018) – Morning Consult today announced it has joined forces with The Hollywood Reporter, the entertainment industry’s flagship media brand, for a first-of-its-kind polling partnership. Morning Consult and THR‘s editorial staff will release weekly polls, with the goal of shaping crucial conversations about the hottest topics and industry trends facing Hollywood today. The Hollywood Reporter partnership adds to Morning Consult’s growing roster of media partners which includes The New York Times, POLITICO, and Bloomberg Businessweek. The inaugural THR/Morning Consult poll, conducted Sept. 27-October 1 among 2,192 adults, takes a detailed look at whether celebrities are effective in influencing Americans on key political and social issues. Americans say Hollywood should (mostly) stay out of politics: 28% of Americans said celebrities should take advantage of every opportunity, from red carpets to Twitter feeds, to discuss political and social issues that matter to them, while a nearly equal number (29%) said celebrities should not publicly express their opinions at all. 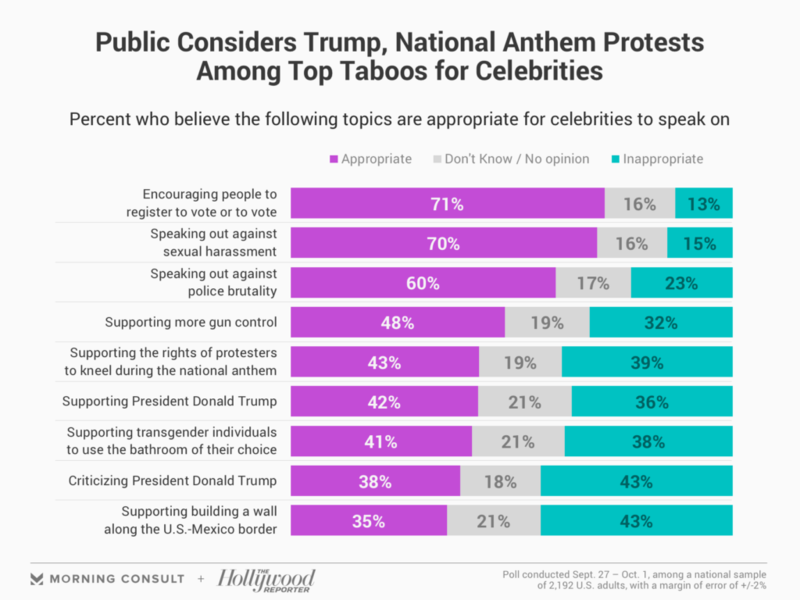 Supporting voting efforts and criticizing the president are the most and least appropriate issues for celebrities to speak out about: The public says issues like encouraging people to vote and speaking out against sexual harassments are the most appropriate issues for celebrities to speak out about. Equal pay, get out the vote efforts, and mental health reform are among the most persuasive celebrity causes: Issues like supporting equal pay (42%), get out the vote efforts (41%), mental health reform (41%), and speaking out against sexual harassment (40%) are the most effective for celebrities to speak out on. 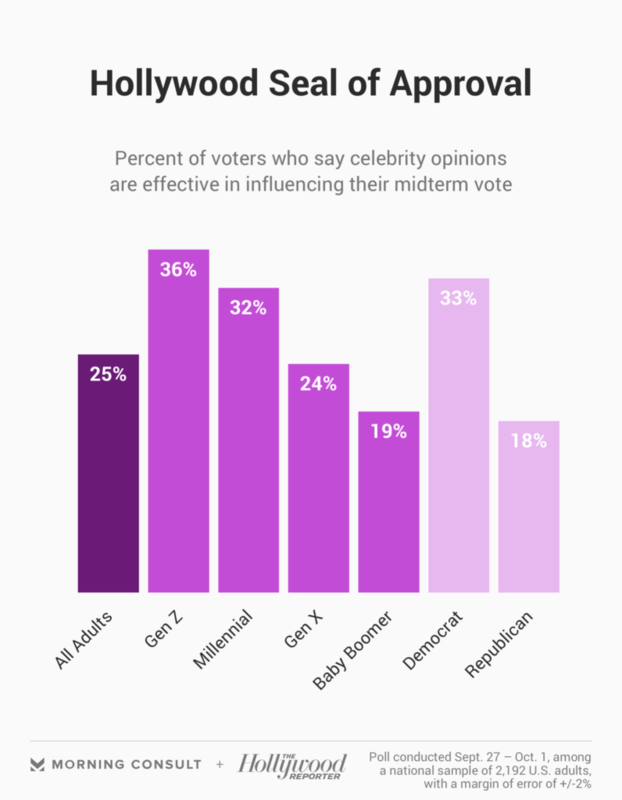 Some say celebrities could influence their midterm voting choices: A quarter of Americans say that celebrities’ political and social stances they care about are effective at influencing their midterm vote, while nearly six in 10 (59%) say it’s ineffective. Full results from this week’s poll can be found here. This poll was conducted from Sept. 27-Oct. 1, 2018 among a national sample of 2,192 Adults. The interviews were conducted online and the data were weighted to approximate a target sample based on age, race/ethnicity, gender, educational attainment, and region. Results from the survey have a margin of error of +/- 2 percentage points. Morning Consult is a leading technology company revolutionizing ways to collect, organize, and share survey research data helping leaders make intelligent decisions about their businesses. With offices in New York, Washington D.C., San Francisco, and Chicago, Morning Consult provides rapid and meticulously-tested research, news, and brand-tracking technology for over 150 of the world’s biggest companies and industry associations. Morning Consult conducts regular surveys for major media organizations including POLITICO, Bloomberg, The New York Times, AdAge, and Vox. For more on Morning Consult, visitwww.morningconsult.com. The Hollywood Reporter is the entertainment industry’s flagship media brand. With in-depth reporting, analysis, unparalleled access, world-class photography and video, and feature exclusives, The Hollywood Reporter is the definitive source for breaking entertainment and business news. THR won a 2016 Webby Award for best online film and video in the entertainment category, was nominated in 2017 and 2018 for a Webby in the magazine website category, and topped the 2017 National Arts and Entertainment Journalism Awards with 17 wins, including Best Website for THR.com. THR also picked up the American Society of Magazine Editors National Magazine Award for General Excellence in 2015 and 2016, in addition to 2015 and 2016 ASME National Magazine Award nominations for Magazine of the Year and a 2016 Gerald Loeb Award nomination for its Studio Chiefs Roundtable. Additionally, the brand took home seven SoCal Journalism Awards in 2016, 14 in 2017, and 12 in 2018; including best columnist for Kareem Abdul-Jabbar and best hard news story for Kim Masters and Lesley Goldberg’s “Amazon Studios’ Roy Price: Inside the Fall of a Top Executive.” In 2014, The Hollywood Reporter staff won Los Angeles Area Emmy Awards for The Hollywood Reporter in Focus: The Wolf of Wall Street. The Hollywood Reporter and SundanceTV partner to co-produce and broadcast Close Up With The Hollywood Reporter, a Daytime Emmy-nominated original non-fiction series featuring panels with potential Emmy and Oscar nominees. THR‘s platforms include an award-winning weekly magazine, dynamic web and mobile sites, a huge social media footprint, and glittery year-round events. The Hollywood Reporter-Billboard Media Group reaches more than 40 million (Q2 2018 Monthly Avg.) U.S. users a month online per ComScore, with a social footprint of more than 36 million, ranking number 18 among comScore entertainment properties in July 2018, delivering news to an audience of industry power players and consumers deeply invested in entertainment content. In November 2017, The Hollywood Reporter saw record-breaking audience growth, with 23.5 million U.S. unique monthly visitors to THR.com, representing a 46 percent year-over-year rise.